Episode 15: Every day Christians around the world pray the Lord’s Prayer which includes the line “thy kingdom come.” But what are we praying for when asking for his kingdom to come? In episode fifteen viewers will learn that the entire Lord’s Prayer is about the promises of the coming kingdom, the Messianic Era. Prayers for daily bread, forgiveness, and deliverance from evil all find their context in the coming kingdom of God. By teaching his disciples this prayer, Jesus instructs all his followers to take hold of this future today. 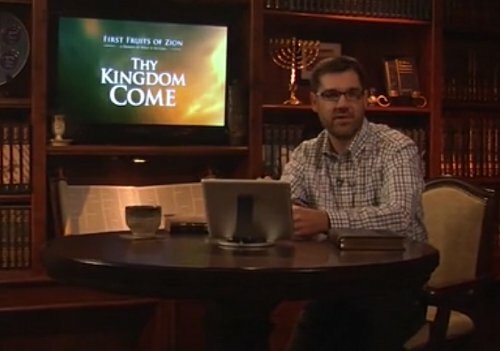 First Fruits of Zion teachers Toby Janicki and Aaron Eby have been spending a number of recent episodes focusing on different aspects of “the Kingdom of God” which is defined as the Messianic Age. Today’s episode drills down into what most Christians call “the Lord’s Prayer” and examines the phrase “Thy Kingdom Come.” We all think we know what that means from a Church context, but when Messiah’s disciples asked him how they should pray and he taught them this prayer, what did “Thy Kingdom Come” sound like to first century Israeli Jewish ears? That’s what this lesson proposes to answer. Toby adds what I considered a little “tongue-in-cheek” (but I’m probably mistaken here) when introducing this subject by saying, “why didn’t Jesus just tell his disciples to pray from their heart?” This could be addressing the distaste most Evangelicals have for liturgical prayer, as if it is dry and spiritless. And yet, it certainly seems like Jesus did teach liturgical prayer to his disciples, and by inference, to us. But more on that in a bit. may your name be sanctified. may it also be done on earth. as we also have pardoned those indebted to us. but rescue us from what is evil. Clue 1: The Kingdom is the Messianic Era. That’s not much of a clue since this information has been provided to the audience (assuming they’re watching all of these episodes in order) a number of times before. Nevertheless, Toby is building up to something. Part of what he’s saying is that “Thy Kingdom Come” was a Jewish phrase long before it was identified as a Christian phrase. To more completely establish this point and to define the Hebrew word “Malkhut” (Kingdom) for us, the scene shifts to Aaron Eby in Israel. Aaron introduces the Siddur or Jewish Prayerbook to his Christian audience and says that “Thy Kingdom Come” and similar phrases are very common in Jewish prayers. Many of the prayers in the Siddur quote directly from scripture, but others are quite old and date back to the time of Jesus and earlier. 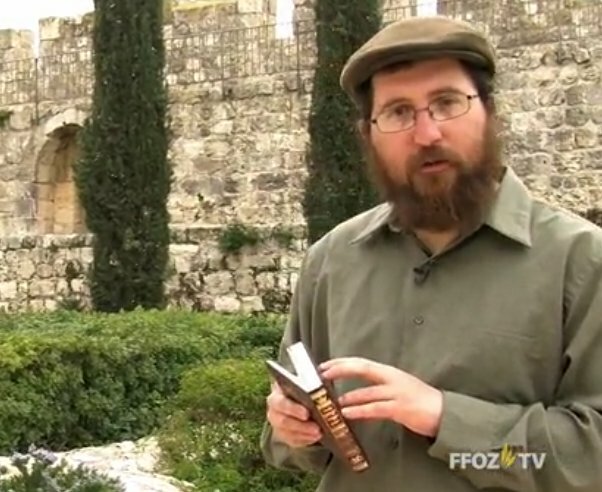 Before getting to the meat of the matter, Aaron gives his viewers a small lesson on Jewish prayer and the use of the Siddur. He then quotes from such prayers as Kaddish and Aleinu to show parallel passages between the prayers in the Siddur and the different sentences and phrases in the Lord’s Prayer. Aaron attempts to establish the “Jewishness” of the Lord’s Prayer and at least implies the prayers in the Siddur we have today that use similar language to the Lord’s Prayer also date back to the time of Jesus or prior in history. That actually would have been a good piece of information to nail down more definitely by showing when each of the prayers that contain such language were written (if known). Were the Jews who contributed to those prayers contemporaries of Jesus, did they pre-date him, or did the live many centuries afterward. It would help to know if Jesus was mining liturgical language of the normalized Judaisms of his day or if a much later Judaism could be accused of “borrowing” Jesus words from history (and I encourage you to watch the episode to see the complete explanation Aaron offers). Clue 2: “Thy Kingdom Come” is a common sentiment in Jewish Liturgy. Toby also said that Jesus was “drawing from the well of liturgical prayers of the Judaism of his day,” echoing Aaron’s statements. If true (and I don’t doubt it), then by doing so, Jesus was saying that there was nothing wrong with incorporating normative Jewish liturgy and practices into the worship of God for his Jewish disciples. That begs the question about modern Messianic Jews incorporating today’s practices from the different streams of 21st century Judaism as disciples of Messiah in their worship and if this is acceptable. Another discussion I sometimes have with my Pastor. Jewish liturgy and tradition being used to teach Jewish and Biblical views of God’s Kingdom, Imagine that. Toby re-reads the Lord’s Prayer, this time from the ESV Bible translation, and asks the question, if a single phrase in the prayer speaks of the Kingdom to Come, what about the rest of the prayer? He tells us that it is his understanding that the Lord’s Prayer speaks of both a believer’s present needs and life, and also addresses the future Messianic Age. I will cleanse them from all their iniquity by which they have sinned against Me, and I will pardon all their iniquities by which they have sinned against Me and by which they have transgressed against Me. “Lead us not into temptation and deliver us from evil” is also an indicator of the Messianic Era, since we are given a new heart and a new spirit that we might not sin against God or human beings. What Toby doesn’t mention is that this specific scripture also establishes that in the Messianic Age, the Spirit within us (or at least the Jewish audience presupposed by Ezekiel) will cause us (them) to “walk in My statutes, and you will be careful to observe My ordinances.” It’s hard to not to read “Torah” into “statutes” and “ordinances,” and echos another recent FFOZ TV episode. Clue 3: The Lord’s Prayer is all about the Messianic Age. Boaz appears on camera at the end of the episode and introduces next week’s topic: the “Keys of the Kingdom”. It seemed to me that after a standard thirty-minute episode, there should have been something more. I hadn’t really given much thought about the tie-in between the Lord’s Prayer and the Messianic Age. I suppose, like so many other Christians, I believed I completely understood what Jesus was saying and didn’t feel it necessary to dig any deeper. But again, I’ve been shown that the Bible contains a greater depth and mystery than seems obvious by just a surface reading, especially in English. I have to admit to not being as “compelled” by this episode as I have by some of the past shows, maybe because so much of the material seemed like a review rather than fresh information. The main thrust of the message seemed to be a simple “the Lord’s Prayer is Jewish and not Christian, and here’s how we prove it.” It’s another brick inserted in the overall structure Toby and Aaron have been trying to construct for their traditionally Christian viewers in an attempt to make Messianic Judaism more accessible and even palatable. I got more out of the further descriptions of the Messianic Era from the Old Testament (Tanakh) scriptures, since this contributes to my investigation of what the Messianic Age looks like when viewed only from the Tanakh. Capturing that view is critical for me in understanding how or if the Tanakh’s portrait of Moshiach matches up to the New Testament’s, particularly the fundamentalist and evangelical Christian interpretations of the apostolic writings. FFOZ is one of the few places I can turn to in order to realize a Jewish perspective on both the Tanakh and the later writings. If they can’t be reconciled, then either our interpretations are flawed or something more dire has happened. Is Ezekiel 36:25-27 just for Jewish people? If you read the larger context, you’ll see the general understanding is that God is renewing Israel. It’s important to remember that we Gentile benefit from the blessings that God grants to Israel but that we have no separate conduit to God without Israel. If God does not bless and renew Israel, there is no renewal for the rest of us. So… it’s only for Israel, according to the context of that Ezekiel chapter. You can read it for yourself, but we are also called by His Name (Amos 9:11-12) and so we have a place in His Kingdom as well…but it’s through the Abrahamic covenant and our faith in Messiah. Alfredo, it is nice having a Jewish perspective, but a Jewish perspective assuming we are referring to Judaism, lacks the Apostolic perspective, which is still Jewish, but it is a break of revelation. According to the Apostles, the gentiles receive the exact same spirit as the Jews. Gentiles in the Messiah are considered fellowheirs along with the promises, meaning gentiles will receive a heart of flesh as well, with the Law on their hearts. Titus 2:14 [Yeshua] who gave Himself for us to redeem us from every lawless deed, and to purify for Himself a people for His own possession, zealous for good deeds. James, I am not a big fan of FFOZ, so I do not follow much of their material, other than the snippets I read, here or there, with that said, does FFOZ deal with the Body of Messiah in the context of the Messianic Kingdom, I have not seen anything from what you posted from FFOZ dealing with the Body, and yet most Christians since they consider the Body of Messiah to be the main course, it seems to be ignored or missed. From a Jewish perspective, that of Judaism, the Body of Messiah does not exist, so we have to approach this and find balance in this with regard to the whole picture. Zion, this is a review of an individual television episode, not an overall analysis of FFOZ and what they teach. The episode addresses a specific topic, though it pulls from other episodes that discuss that topic. You probably aren’t going to find something in this review that wasn’t part of the television episode and my impressions of it. There’s a push-pull in our understanding of the Body of Messiah. An oversimplification of our positions is that you believe that everyone in the Body is uniform and identical except for a string of DNA and perhaps some minor differences in the covenant promises to Jews vs. Gentiles (since Gentiles by definition, cannot belong to an Israelite tribe and thus have no obvious inheritance to any part of the Land of Israel). I, on the other hand, also believe the Body of Messiah is made up of Jews and Gentiles, that we are equal in receiving the Spirit and equal in salvation, but distinct in covenant identity within the Body. I have no ability to convince you of the merit of my perspective so I’m not trying to do that, but I thought Alfredo (and others) might appreciate a brief, thumbnail sketch of our different viewpoints. I understand, but do they have anything addressing the body of Messiah concerning eschatology? Just wondering. Eph 4:4-6 is more in line with what I believe, sure there still remains differences between Jew and gentile and male and female, but they should never be elevated above our unity and purpose as one body. If you mean on their television show, I don’t know. I haven’t reviewed all of the episodes yet. As far as what FFOZ does or doesn’t believe, you’re going to have to ask them or review all of their materials yourself, Zion. I may read, watch, and review some of their output, but I don’t work for them (except for a few contracted articles I wrote for Messiah Journal as a freelancer) and I don’t represent them. I’ve already given you an “in a nutshell” view of my understanding of “the Body” and don’t have time to craft a more detailed description right now. Interestingly enough, you and traditional Christianity have the same basic opinion: Jews and Gentiles in the body of Christ/Messiah must be identical. Christians believe they’re identical in all being freed from the Law, and you (and this is an oversimplification) believe that everyone in the body is identically bound to the Law. The closest I can come to quickly answering your question is to ask that you read this blog post of mine. It was spawned from one of my conversations with my Pastor, so hopefully, it’ll help in responding to you. Yes, “in a nutshell” that is correct, identical is a stretch, but very similar is more appropriate, or as Paul says fellowheirs, part of the commonwealth of Israel, sharing the covenants of promise, all of these things, only belong to Israel, but in Messiah gentiles can now take hold, if that is the case, then they are more alike than different. 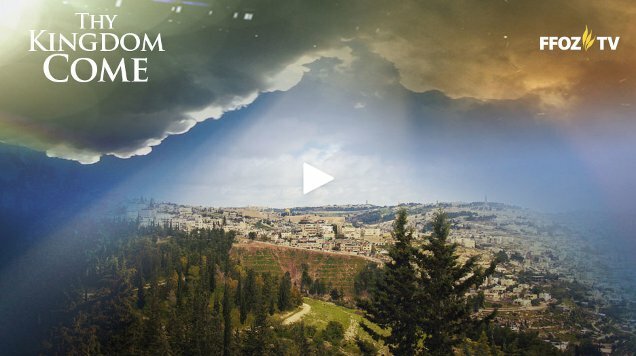 Take Israel’s ultimate calling, “to be a light to the nations”. That is a calling of Israel, not of the nations, however, when we see the gentiles coming to be disciples of the Messiah, they then are called to be “a light to the nations” along with Israel, taking on part of Israel’s calling. Lets go further, Israel is called to be a kingdom of Priest to God, yet we see multiple places in the Apostolic Writings of the body of Messiah, also being declared a Kingdom of Priest..(Rev 1:6). There are many more examples, but the point is, there is overlapping, trying to keep the body of Messiah and Israel or in this case Jews and Gentiles in the Messiah having completely distinct purposes and callings, is inconsistent with scripture, if it was consistent I would probably agree with you, but there are to many issues with your view point. Thank you, I will check it out later.